i just found a cheap source of magnets so this thread is being created with my plans/prints of a true almost free energy device. to start off you will need neodium magnets. 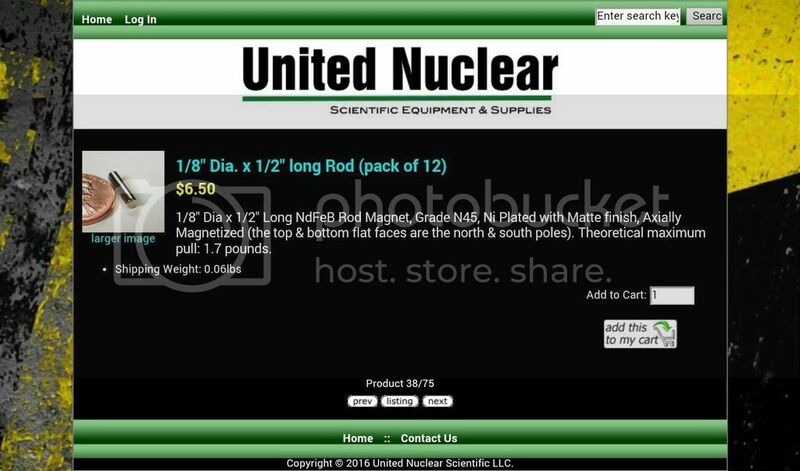 united nuclear has them at a very reasonable price. next ,get some plexiglass or plastic cutting board about 3/4 inch thick or thicker. these should be cut into circles about a foot in diameter. with a center hole cut in one to mount to a generator.specs later as i build and refine. the trick to this machine is that it only takes one magnet to neutralize another magnet. the next trick to learn is a coil of wire wrapped around a magnet will cancel it out when voltage is applied to reverse the polarity of said magnet. the last complicated trick is when magnets are laid out in a circle a toroid field is created.it doesnt matter which way they are oriented.generally speaking.a toroid field is created. this is a no go for my plans and is only good to cause unit to die. so imagine two bananas, "drive zone/push ". one layed out at top of circle with with ends pointed down and the other at bottom with ends pointed up. now imagine the gap between the bananas. this is the dead zone.without the dead zone the circle of magnets would be a toroid but if the dead zone magnets are wrapped with wire and charged.the dead zone magnets die. now some would say your using electricity to kill magnets.yes but if 4 magnets are dead and 16 magnets are pulling then its over unity.16-4equals 12 magnets pulling.thats power. in reality all magnets will be wrapped with wire coils but will only be turned on at certain times. the timing will come from the other plate. this plate will have metal tape sectors with brushes. as wheel spins around from repulsion of magnets.the segments will make contact and cause voltage to go to the coil that is needed to cancel the dead zone magnets. the generator will charge a battery thats connected to the brushes. crappy pics will follow using cheap drawing app. i dont know how long magnets strength will last but neodium should last longest. once this is almost completed.i will put an inline variable resistor to sorta "tune"it.basically it will give the coil ,thats cancelling the magnet out,just enough to balance out the load on the generator. this is probably the wrong way to do it ,but i just want to keep it from going too fast and flying apart. in an everyday home use situation. it would have a load system that adjusted rpm to correct output. also board that magnets will be on ,will be stationary.drive will come from a spinning bar with magnets on ends.its easier to balance it than a disc full of magnets. i need money and this generator will make me money way easier than my ufo motors,so priority will go in that direction. im having a time right now with theory as ive come across some research into cancelling magnets .its really good research though.interesting reading about permanent magnets being wound with solenoids.